We’re at that time of year when people wish each other a great new year. But wishing won’t bring you success. Planning will. And we know statistically that plans that get written down are much more likely to get implemented than those that aren’t. “A goal without a plan is just a wish” someone once said. 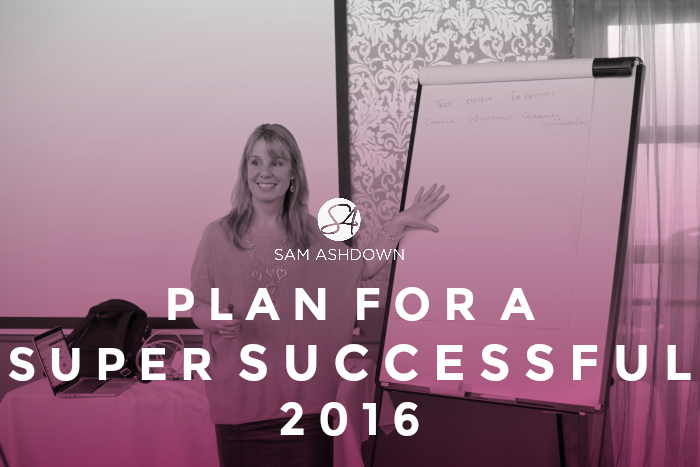 So – are you ready to make a plan for a super successful 2016? Take a blank sheet of paper. Writing this stuff by hand is somehow much more powerful than typing it. You can always make it pretty in Word and/or Excel later. What were your biggest business accomplishments last year? What customer service challenges did you experience? What marketing worked the best for you? What was your gross profit in 2015? How many days did you take off? What did you enjoy least in your work in 2015? What was the best thing for you? Make a ‘Gratitude list’ of the 10 (or more) things you’re most grateful for in the last year. Draw a pie-chart of how your time was spent in your business in 2015. Don’t try to make it too exact, just colour it in roughly as you feel you spent your time. Your sections could be marketing, staff management, technology, etc. What does your business look like at the end of 2016? What needs to happen for this to become a reality? Your income goal for the year? How you will achieve this. How many valuation appointments will you do in 2016? What holidays do you plan on taking in 2016? What days and hours will you work? What donations (time or money) do you plan to give in 2016? Now draw a pie-chart of how you would like your work time to be spent this year. How does it look different from last year? What do you need to do to make this happen? If you’d like some help on making your 2016 the best year ever for you and your business, get in touch! And remember my motto – Soon is not as good as now.